Issues related to career success for managers have long been cited but very little attention has been given to it from the Islamic perspective. The Islamic perspective emphasizes more on intrinsic (subjective) career success, setting references from the life of Prophet Muhammed (PBUH. following his footsteps, having Taqwa in heart in order to aim for ultimate success in career. The Islamic perspective of career success differs from the western or the so-called socio-cultural prediction of career success. The spiritual aspect is completely neglected due to the fact that most career success theories have originated and constructed from the Western perspective with no weightage given to the Islamic perspective. This study proposes a conceptual framework exploring the possibility to investigate the role of Taqwa in the career success of Muslim managers. It attempts a theoretical framework with an empirical model of career success from the Islamic perspective, specifically aiming to investigate direct relationship between Taqwa and career success. The outcomes of the study contribute towards theory from individual as well as managerial perspectives. TUERWAHONG, Shaliken; SULAIMAN, Mohamed. 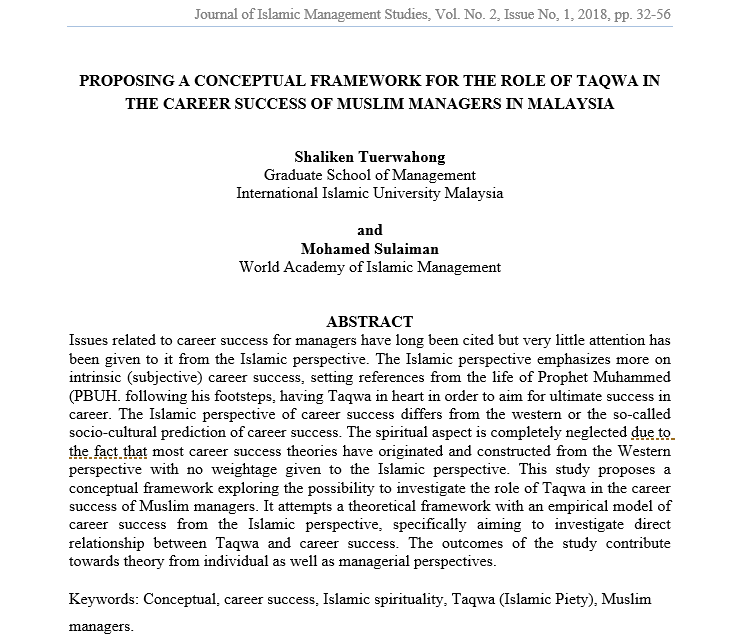 PROPOSING A CONCEPTUAL FRAMEWORK FOR THE ROLE OF TAQWA IN THE CAREER SUCCESS OF MUSLIM MANAGERS IN MALAYSIA. Journal of Islamic Management Studies, [S.l. ], v. 2, n. 1, p. 32-56, mar. 2019. ISSN 2600-7126. Available at: <http://publications.waim.my/index.php/jims/article/view/97>. Date accessed: 24 apr. 2019.